Traveling around the world is now possible from Barcelona, thanks to the new Museum of World Cultures. Opens tomorrow February 7th and will ambentrada free for two months, until April 7th. Inside, gathering 500 pieces of art from Africa, America, Asia and Oceania. The European art, says its director Josep Lluís Alay is very present in the space, the houses and the Marquis of Christmas Llió who have been rehabilitated and equipped. The museum project divides the pieces countries and continents, in order to give visibility to Barcelona and its heritage have attracted collectors from the late forties. The rooms of the new museum feed Folch Collection and the Museum of Ethnology of Barcelona, as well as other donations which include the University of Cambridge, 15 objects from Polynesia. 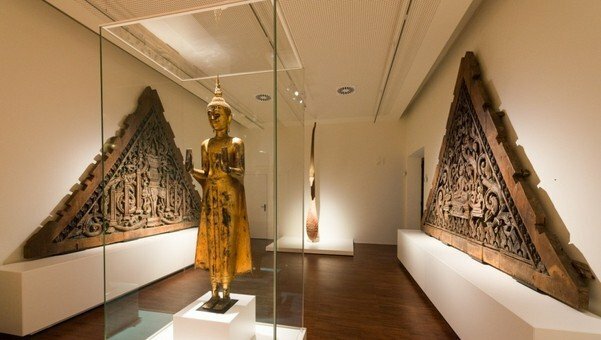 Among the exhibits there are some special value as a small Buddha fasting unique in Europe. Only three have survived the whole world and one of them lies far from the Museum of World Cultures in Barcelona. The facility is also the scene of a majestic room masks or two funerary sculptures of wood, almost 5 meters, made from a single trunk and New Guinea. According to Alay, “we recognize that there is art, and art has always been to Asia, America, Oceania and Africa, there are different levels arts, but art is a universal concept of humanity “. As the Deputy Mayor for Culture, Jaume Ciurana, “is an art museum but has a special interest in putting the pieces of art in its historical, geographical, social and symbolic.” It is in this sense that the research to make the museum have been profound and have uncovered, for example, that municipal funds retained several works best African artist, Olowe Ise. Thanks to the collaboration of the University of Wisconsin have been able to attribute the pieces, a rare occurrence in African art.